The wand mask is also known as the Columbine or Columbina mask. 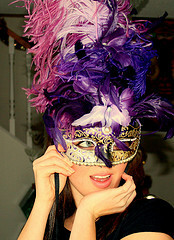 They are usually half masks and highly embellished with gold and other metals and feathers. The stick portion of these masks is used to hold the mask up to one's face. The Columbine, or wand mask was made popular by an actress named Columbina in the Commedia Dell'arte. Legend has it that the wand mask was designed for her because she was so beautiful that she did not want to completely cover her face when wearing a mask. Clicking the links below will open a new window in your browser with a full description of the Mardi Gras Mask Wand for sale on eBay.